We all have an inner critic who’s voice can be heard nagging, blaming, shaming, shouting or attacking us. For day 21 of build creative confidence, I want to talk about honoring your inner critic and turning him or her into an ally instead of an enemy. In his insightful post a few days ago, Andy Shackcloth calls this voice your inner editor and share tips on how to make friends with that critical voice that often causes us to procrastinate or avoid moving forward with our creative endeavors. Today I want to take a more visual approach to honoring your inner critic that I think will make it easier to to make friends with and understand that nagging voice inside your head. “We are complicated. All of us are continuously influenced by an ocean of unresolved material that churns nonstop inside of our brains and bodies. This stormy sea is comprised of our unchallenged thoughts, beliefs, attitudes and emotions. It is a tempest that never rests. New cloudbursts are constantly seeded by conflicting opinions of friends, family, coworkers, authority figures and the media. Dr. Helge has great information on her blog and in her book on Conquering the Inner Critic, so if you want more of the scientific background on the who and why behind your inner critic, I encourage you to look at her blog. For this blog, I want to help you take a shortcut that will easily and effectively harness the creative power of your inner critic. 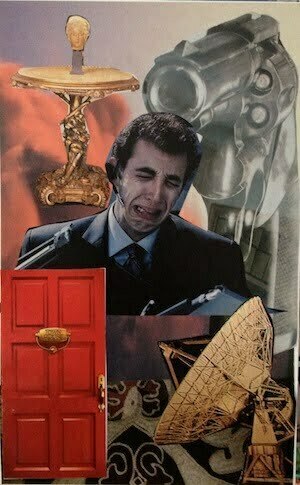 For today’s lesson, you are going to create a collage that visually represents your inner critic and practice having a dialogue with her or him that will move you closer towards befriending the inner critic instead of running away or trying to stuff that annoying voice deep down inside. In this image, can you tell that I am feeling under the gun sometimes? My inner critic can lead me to feel pressured, overwhelmed and in fear for my life. Silly isn’t it, but that’s how it feels sometimes. In the image at the top of this post, you can see Martha, my inner critic. What a B—- she can be but we are working on it. While she drives me crazy at times, she is also the one who helps me get things done in a timely manner. She is way more organized than I am, too. Together, we make a good team as long as I can keep her under control. You can email me if you are interested in learning more about SoulCollage® or would like to take a private tutorial with me. For today, I want to give you a taste of the collage process that will help you honor your inner critic. Set aside about 30 minutes for this activity. Find a quiet space and have all your materials collected. You might want to light a candle or play some favorite music. 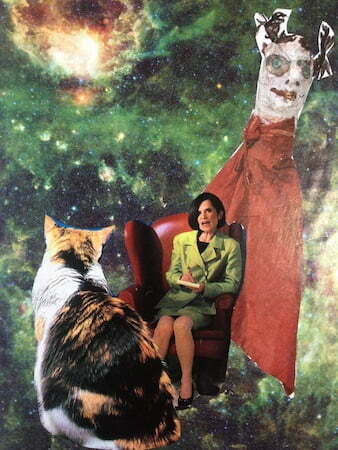 Set an intention to create a collaged image that captures the essence of your inner critic. Don’t look for specific images, just tear out the ones that speak to you. Take about 15 minutes to flip through magazines and tear out pictures. This part is super fun and it can be easy to get lost in the magazines. Set a timer to keep track of time if you are on a tight schedule. Go through the images and look at them carefully. See which ones go together and feel like a match for your inner critic. Begin to lay them on your mat board or cardstock. Don’t glue them down yet! Take your scissors and carefully cut out the images you are drawn to. Separate the images from their background. You can see in my example above that there is a background image layered with several other images. Once you feel happy with the images and the background you have created, commit! Use the glue stick to glue them down. Now look at your card. Does you inner critic have a name? Can you hear his/her voice in your head? Take out your journal and write down a name if you came up with one. If not, it might come to you later. Now write down everything about your inner critic that drives you crazy. Minette: Hey, Martha, I really need to get this project finished and I need your help. Could you please offer me support and not be so nit-picky about all the tiny details being perfect. Martha: But Minette, it has to be perfect or it won’t be good enough. Minette: Martha, at some point we need to just get it going!